Look for acceleration of the already active California microgrid market following yesterday’s announcement that *proposes 10 new projects for $51.9 million in microgrid grants. The money comes from the California Energy Commission, which had originally planned to allot $44.7 million but increased the offering after reviewing the 60 grant applications it received from a solicitation issued in August (GFO-17-302). The applicants were required to commit to pay a portion of the project costs. The 10 winners offered $72 million. When added to the grant money, that brings total investment in the microgrids to $124 million. …that brings total investment in the microgrids to $124 million. 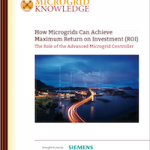 The commission offered the microgrid grants to accelerate the commercialization of microgrids. The money was allotted to renewable-based projects in three groups. Group 1 focused on California military bases, ports, and Native American tribes; Group 2, disadvantaged communities; and Group 3, microgrids that provide “clear and definable added value” for electric customers. The commission staff had already announced four of the Group 1 winners in January. The final list of 10 winners, released yesterday, includes the first four projects. In addition, commission staff named a fifth winner to Group 1, a microgrid at the 10th Avenue Marina in San Diego, a facility that is undergoing a $24 million upgrade. The 10 projects must still undergo a final vote of approval by the commission. Santa Rosa Junior College Urban Microgrid Project, Sonoma County Junior College District/ Santa Rosa Junior College, $4.9 million. From a monetary perspective the largest project is Willdan’s San Jose Community Microgrid, a $13 million investment, including the portion the applicant will pay in cost-share funds. Funding for the grants comes from the Electric Program Investment Charge (EPIC), money collected within rates charged by the state’s three investor-owned utilities: Pacific Gas & Electric, San Diego Gas & Electric and Southern California Edison. The state sought projects that advance the business case for microgrids and produce repeatable, standardized, commercial-scale configurations with measurable benefits. The projects also must support California’s energy policies, reduce greenhouse gases and attract non-EPIC funding for future microgrids. This is the second — and largest — major solicitation for microgrid projects issued by the California Energy Commission. In its first round, the commission offered $26.5 million in 2014, which resulted in seven microgrid demonstration projects. The state already has several well-known microgrid projects either under development or in operation. Among them are microgrids in Borrego Springs, University of California, San Diego, Stone Edge Farm Estate Vineyards and Winery, Blue Lake Rancheria, and Miramar. *The grants must be approved by a business meeting vote of the California Energy Commission before the money is allotted. Learn about microgrid grants and other financing opportunities at Microgrid 2018, May 7-9 in Chicago.